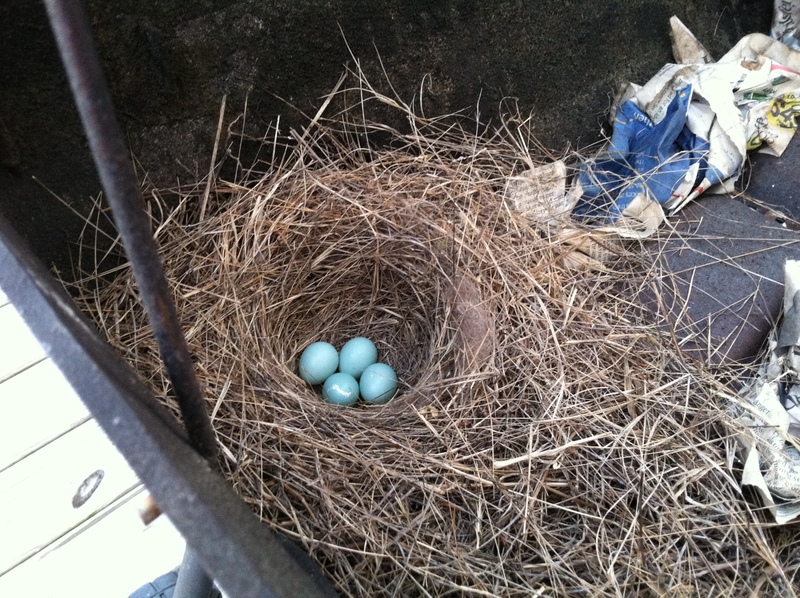 So last season we had an old black grill that we found out blue birds laid eggs in. They had hatched and it was the middle of summer. It soon became apparent that the black grill was not an ideal place for these baby birds. Plus it was a very hot summer last year. I tried to the best of my ability to save the baby birds. I would take them water in a dropper to keep them cool and tried watering down the grill itself. I was gone from home one day and when I returned the sweet little baby birds had died. I was devastated. Being the organized people we are..NOT, the grill is still sitting on the back porch. It is a perfectly good grill we just have a new one so it is hard to just throw it out. Anyway, I digress, the other day I walked out on the porch to check on my tomatoes and noticed a blue bird couple sitting on the railing and my stomach dropped a little. Sure enough they have decided to give it another try in our grill. I had left the old nest in the grill thinking that they like to build new nests so they would not come back to it anyways. It is not nearly as hot this year but I just did some research and it takes 12-14 days for the birds to hatch and then 20 days before they leave the nest and go out on their own. So it will be early June before they head out. I only hope I can help keep them alive this year and that it doesn’t get as hot as it did last summer. Any suggestions on what I can do this time around to make sure my little guys survive? Wow, as I am sure you are aware I haven’t posted anything in a few weeks. 16 days ago DD3 started getting sick. I knew something was up when I found her asleep in her room watching TV. She NEVER takes naps anymore unfortunately. I was up with her all night for 3 nights when I started to get sick too. Fast forward to today and I am finally starting to feel like a person again. The first sign that something was wrong! 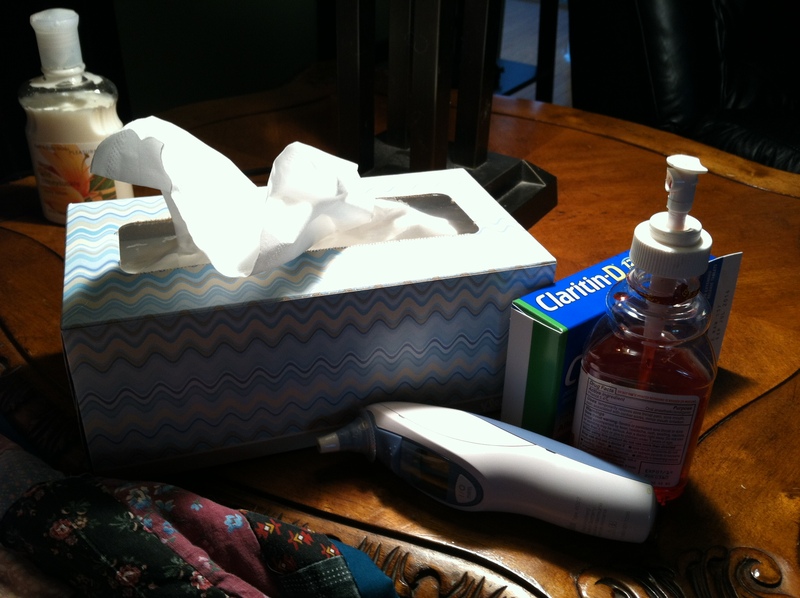 I am not one who normally gets sick but when I do it I do it good! I took DD to the doctor to make sure she didn’t have the Flu or Strep. 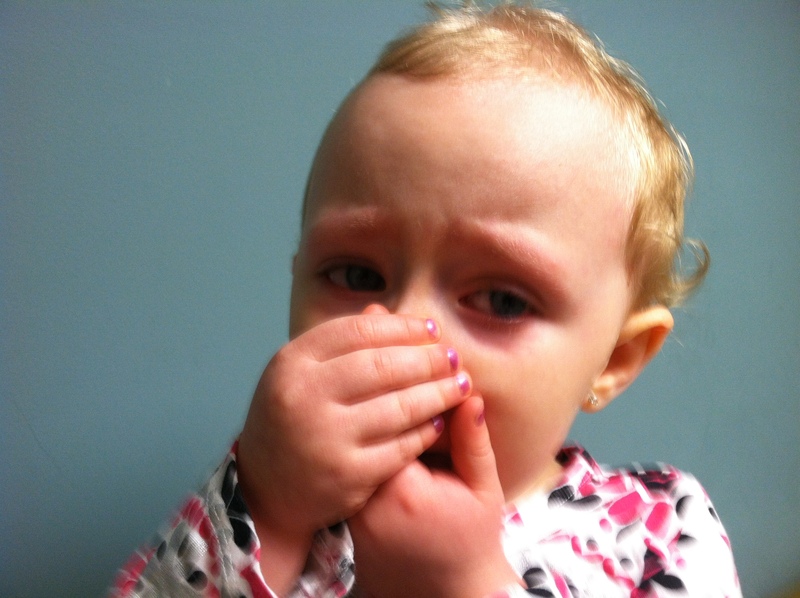 Luckily she didn’t but it was so cute when the nurse told her she had to get a sample from her nose and throat to test she just did what she could to avoid getting tested. Trying her best to not get poked and prodded by the doctor! Luckily she didn’t have the Flu or Strep but she had an ear infection and viral infection, I was lucky enough to get the viral infection :(. Sore throat, cough that would not relent, fever, body aches. It felt like the Flu and strep all rolled up into one. It is nice to be able to breath, smell, taste, and go 5 minutes without coughing again. Needless to say during those days I did not feel like opening my eyes much less trying to make a cohesive sentence. My bedside for a week! My book has fallen to the side too! I am hoping I can get something rolling on it again too. I am so close to the end of the first draft. I need to get it done so I can move on to the next major portion which is revision #1. I know a lot of things I need to revise and update in the story and I keep trying to go there instead of finishing the first draft. But the good news is we are both on the road to recovery and I see productive writing in my future! Inventions and Ideas: Ahead of the times or Behind? I was going through some of my old notes and story ideas earlier today and I came across some stuff I had written in 1999. It was ideas for inventions that would make my life easier at the time. 1. 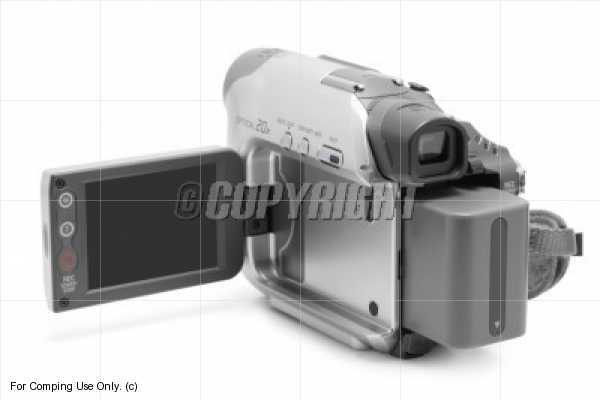 An electronic device that you could somehow hookup to your cell phone via a CD-disk or something similar that would allow you to enter a name and it would show you telephone listings for that name. 2. Another device that you could carry along with your palm pilot that would store and organize your coupons. Fast forward 14 years – really has it been that long since 1999? It is absolutely amazing how much our digital world has changed in those years. My iPhone is both of those things plus so much more, that one little device now takes the place of so many, for example. The iPhone is also a computer, calculator, game player, GPS, email, notepad. I did not intend for this post to turn into an iPhone commercial but come on! How is that not amazing when you stop to think about it. At the time I had those ideas my little iPhone did not exist and I was really showing some forward thinking. Too bad I didn’t move ahead with some of my ideas. Who knows we might all be talking on sPhone’s if I had! Every Pretty Saturday between April and October we go yard selling. No we are not hoarders but one look in our basement might tell you otherwise! Actually my husband’s job is Ebay. It started rather simply with listing a few items for my parents who were buying storage units at the time. (This was long before Storage Wars and Auction Hunters became big hit TV-Shows.) But the point is they would buy these units and there were often items that were just not meant to be sold at yard sale prices like she was selling the contents of the units they won. 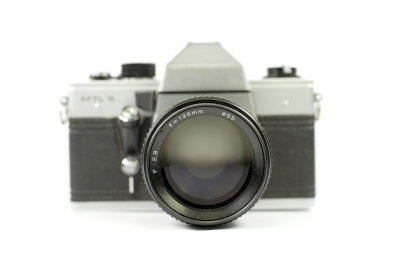 They were higher value items that needed an outlet…..Ebay became that outlet. Once mom and dad started making some decent money on the items we listed for them, I started going around the house and finding things to sell. I soon ran out of things in my house and hubby (who was currently without a job) and I set out one Saturday to see what we could find at yard sales. Fast forward 10 years later and hubby is still working our Ebay store. This is our Ebay Store Link! So with that in mind I thought you guys might find it interesting to see a few of our “finds” each week and decided to start a weekly post about our best finds from Saturday. We found some pretty good stuff this weekend and the best part of finding a good item is not really the item itself, although that is always cool. 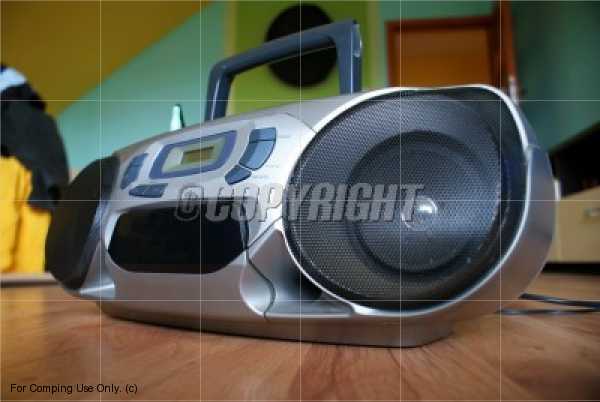 The best part is when you can get that item for pennies on the dollar and know you are going to make money on it. We are not likely to “get rich” doing this business but it does allow hubby to work from home like me and it allows us both to be able to be full time parents. Not too shabby. 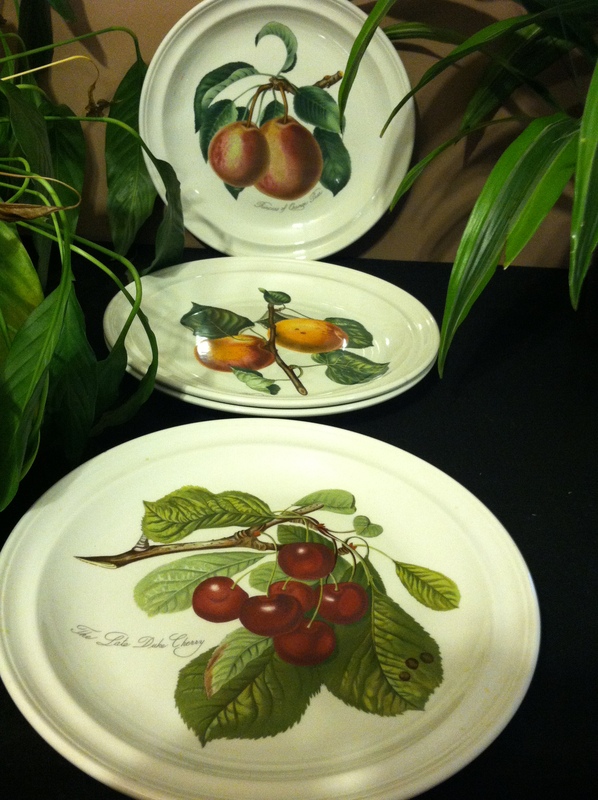 One of the cool finds we made was a set of 4 portmeirion pomona fruit plates. I paid 5 for all 4 of these plates. When I looked them up on replacements.com the dinner plates are going anywhere from $39-$69 each. Granted I am not going to get that for them on Ebay but still a great find! Next is probably my favorite mainly because I only paid $.50 and yes you read that correctly – Fifty Cents! 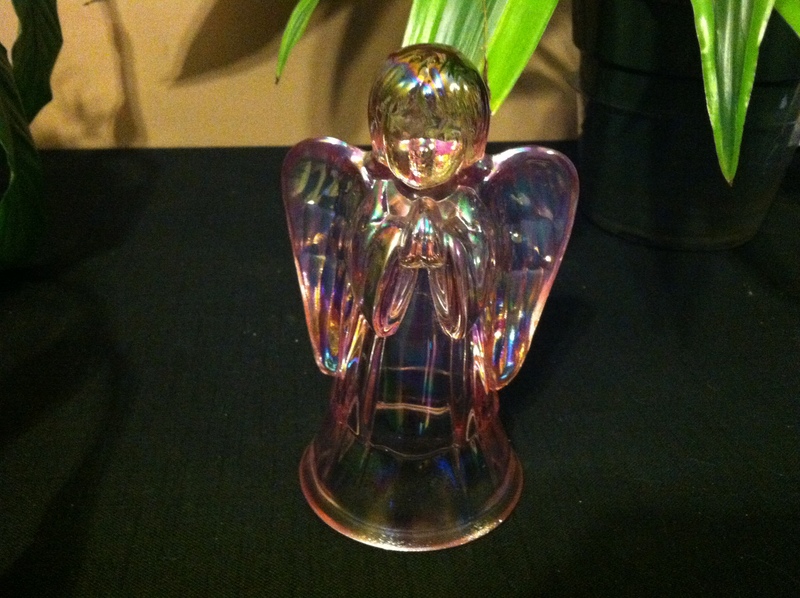 It is a lovely Fenton iridescent carnival glass angel. Again I am not going to get rich on this little Angel but paying .50 (money that you can find in your couch seats) for an angel I can sell for at least $20 is pretty cool in my book!. And just because I am a girl and a kid at heart I had to share two more items! 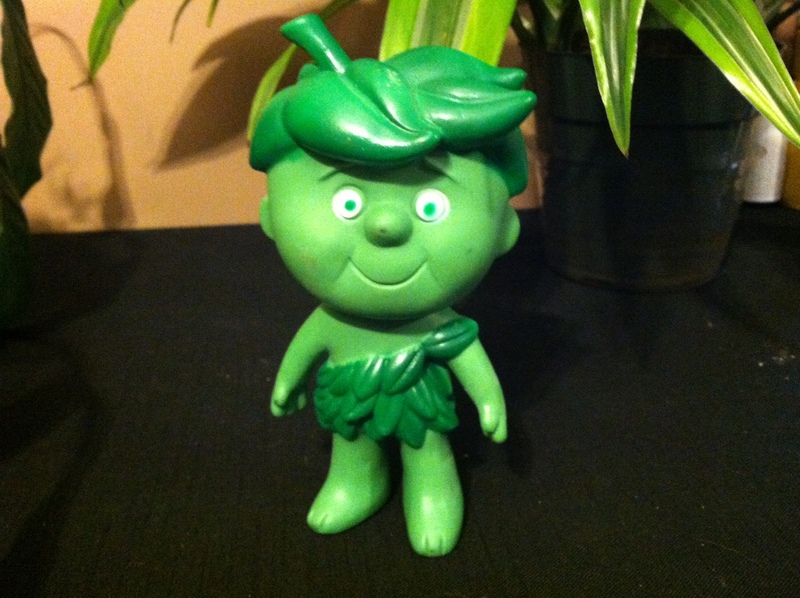 First is a vintage Horsman Mary Poppins Doll and the second is The Baby Jolly Green Giant! Both Vintage Items that bring back nostalgia! 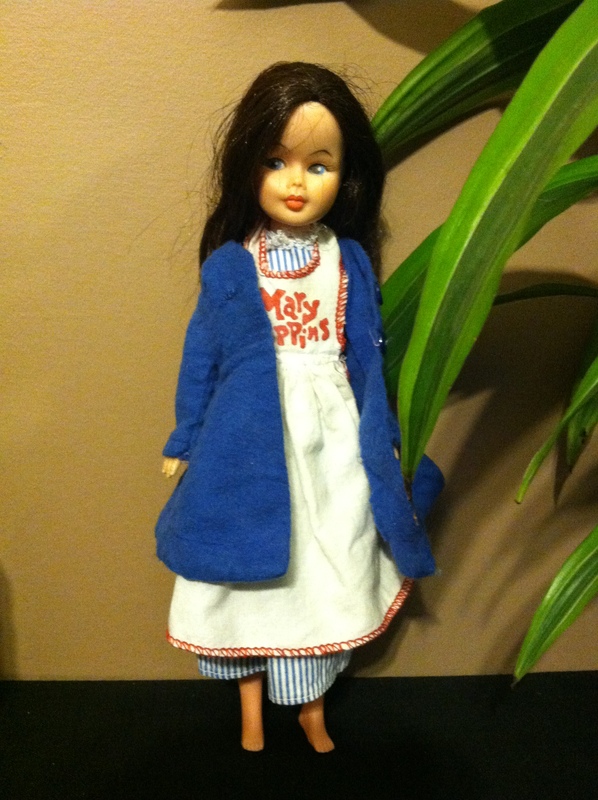 Vintage Horsman Mary Poppins Doll! Vintage Baby Jolly Green Giant! I hope you enjoyed reading about our treasure finding. I will be on the lookout next week for something amazing! Well, I am on the lookout EVERY week for something amazing! Where is the Strangest Place you have ever lived? I started writing a story this morning about ghosts and my life and realized that I need to write my “life story” for that it was getting so long but what it did lead me to realize is that I have lived a lot of crazy places. My parents were what you might call gypsies, meaning they traveled around and settled for moments at a time. They were subcontract painters for apartment complexes and they went where the work took them. Pretty much back and forth between Florida and Georgia. We lived in houses and apartments all over those two states. After my brother was born, before he could even walk we lived on a houseboat on Lake Allatoona in Acworth, GA.
Front of our houseboat. See baby brothers crib out on deck! We lived there for less than a year I believe. The deciding factor in us moving off the houseboat was when my mother was holding my baby brother and stepping off the boat onto the dock. She didn’t make it and into the winter lake water she and my brother went. My mother was loaded down with leather boots, a leather coat and a purse that weighed as much as small airplane, all that and my brother. I remember watching my brother’s head bob up and down in the water. Being under the water more than he was above the water and being afraid that I had lost them both. I was barely 7 years at the time and there was nothing I could do to save them except scream for help. My father was already at the end of the dock and unable to hear my screams. Luckily some of our neighbors heard my cries and came to the rescue of my mother and brother. Needless to say we moved off the boat very shortly after that incident. You might think that was the strangest place I lived but it isn’t really. My dad bought some land and we moved a small trailer onto it while we were building our house. 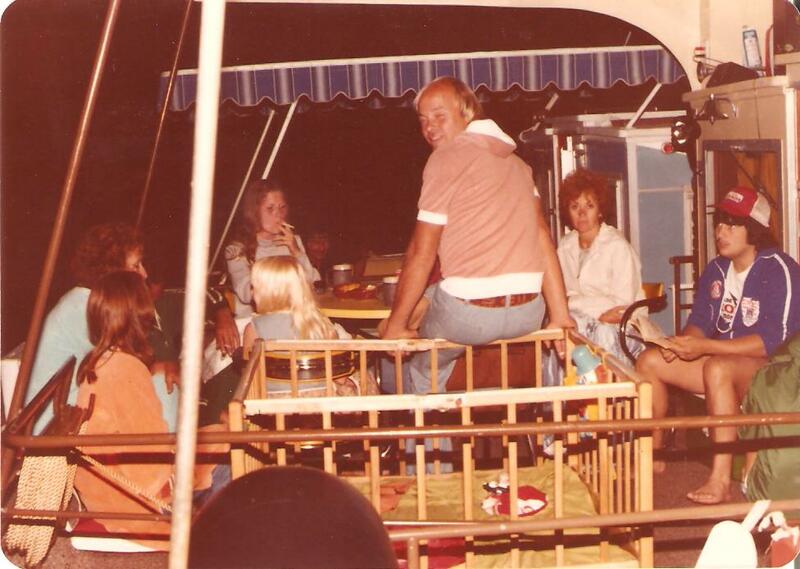 We lived in that trailer with phone on a tree outside. It was the early 80’s so the only people with cell phones were CIA and FBI! The trailer was way too small for the 4 of us so we moved into the house we were building when it only had a slab, outside walls and electricity. The outside of the house! 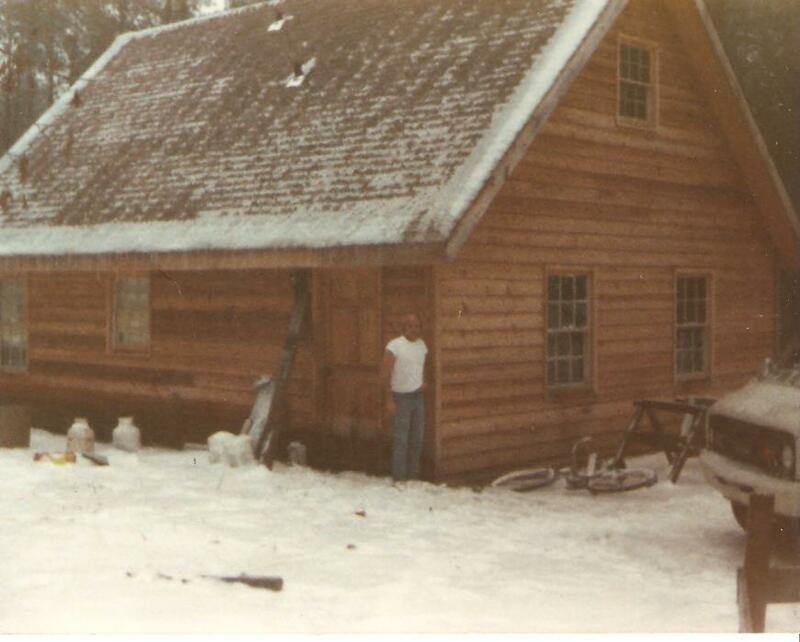 It didn’t even have indoor plumbing at the time we had to go to an outhouse that was set up to use the potty for a few months. My absolute most favorite birthday gift I ever received was on my 12th birthday. 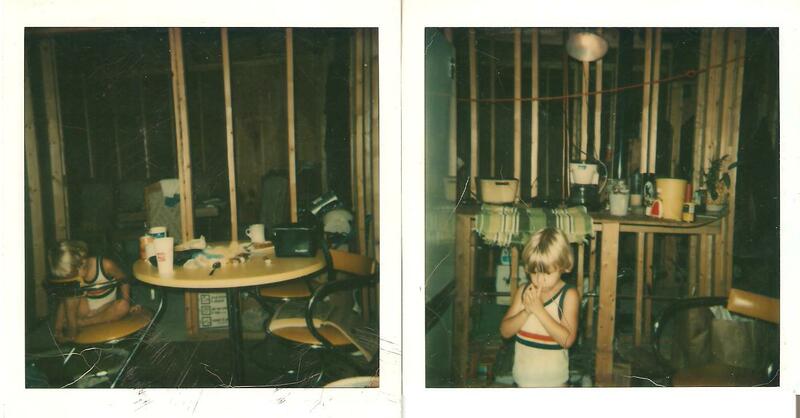 We had been living in the house we were building a while now and still the only room that had inside walls was the bathroom. Our Kitchen and Dining Room at the time! I remember my parents telling us we couldn’t go upstairs because the builders were working and it was very dangerous. 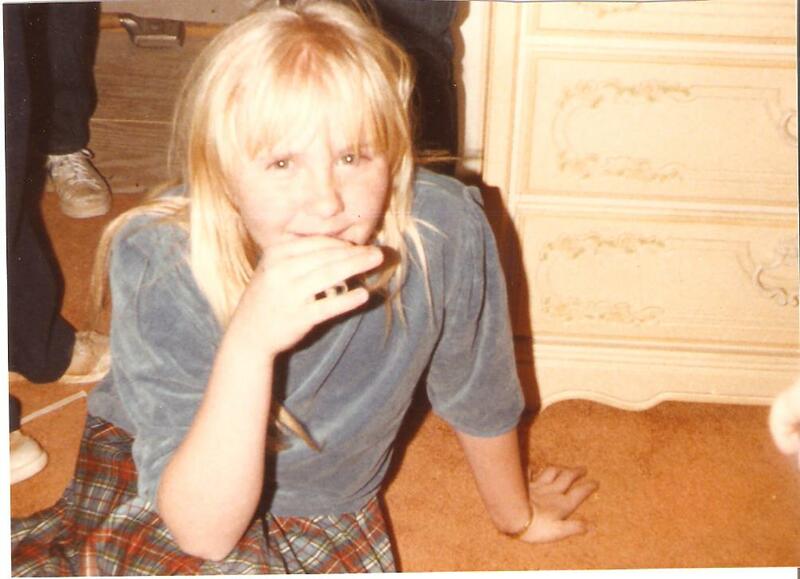 On my 12th birthday I was taken upstairs past the rooms with only studs for walls, to a door. Besides the bathroom door downstairs it was the only door in our house. When the door was opened I walked into a fully finished and fully furnished bedroom. I had a canopy bed and all my furniture. I had decorations and walls that were painted. I had a walk in closet full of new clothes. I had carpet and a window. I even had a telephone by my bed. Me in the floor of my finished bedroom with Carpet… If you look behind me you can see through the door of my room the hallway was still only wood planks! Outside the room was an unfinished house with only studs for walls but inside the room you would never know it. It was by far the absolute best gift I could have ever been given at 12 years old! So, a houseboat, a trailer with a phone on a tree, and house with no walls, those are the 3 strangest places I have ever lived. Each Week TerribleMinds Chuck Wendig has a Flash Fiction writing challenge for us. This week it was a Secret Door Challenge. Simply to follow the link through the Secret door and it will take you some place. Write about that place in no more than 1,000 words. My knuckles were turning white and hurting. I was grasping so hard to the wood railing. Knowing, fearing deep inside that at any moment the bridge was going to snap and leave me dangling above the mouth of the roaring river below. There was no one here to save me if it did happen. There was no one here to encourage me to keep going that it would be ok. I thought about Jake. He would push me. He would encourage me if he could. But right now it was my job to push through my fear. It was the only way that Jake would survive. I had to make it across the bridge and back down to find help. Jake was lying helpless, broken, on a boulder at the base of one of the canyons. We had spent last night camping out, snuggling under a warm blanket by the campfire and watching the stars as they filled the sky. There were no distractions from lights of the big city out here. When night fell the sky overhead filled with thousands of stars. It was like being in the middle of nowhere. Right now I felt like I was in the middle of nowhere and alone. The bridge still loomed ahead of me. I was no more than 4 or 5 steps onto it. When we had crossed this bridge yesterday I had held on to Jake’s hand and closed my eyes as he guided me to the other side. He was my hero and I was going to be his wife. He had asked me just last night as we sat and watched the shooting stars across the sky. Panic coursed through me and caused a tremble that shook the entire bridge. What if he didn’t survive? I had to get to help. I had to get to the other side of this bridge to do that. I slid my hand along the wood railing a few inches, closed my eyes and started to walk slowly. The ground under me shook, rocked actually in the wind and from the movements I was making as I crossed. I kept my eyes closed and put one foot after the next. Step after step, I knew I had to be almost across the bridge so I opened my eyes to find out. I was in the middle, too far to turn around and go back and not close enough to the other side to feel freedom. A large bird flew down from his perch and landed on the railing a few feet in front of me. Just the landing of the bird caused the bridge to sway. Panic and fear took over and I fell to my knees, my legs too shaky to stand. There were wood planks along the bottom of the bridge and I grabbed onto them as I began to crawl on my hands and knees. One slow crawl after the next. I made the mistake of looking through the plank on the bottom and down into the raging river that ran beneath me. The fear was overwhelming now as I had let the panic take pure hold of me. I sat unmoving for what seemed like hours but was probably only minutes. I relived our moments last night. The fire was crackling in front of us and we were huddled together fighting off the chill that the canyon brought with it. Jake had acted like he was going to get us a soda out of the cooler but instead he pulled out a wine bottle and two glasses. I had done most of the packing for the trip so I didn’t know how he managed to sneak that in. He sat the bottle between us and I read the label. It had cursive writing all over it and it was written in multiple languages. The bottle was filled with words but they only said one thing over and over, “I love you Clara, will you marry me?” My heart was filled with Joy. I had never had someone love me as much as Jake loved me. I had never loved someone that much. And now our future was uncertain. If I could not bring myself to cross this bridge and get him help then certainly he would die and my heart and life would die with him. I could do this for him, for us, for our future. It was time. I took a few deep breaths and opened my eyes. I stood very slowly pulling myself up and steadying myself in the center of the bridge. I kept my eyes open this time. I was pulling my strength from Jake right now I was walking towards our future. Step after step after step I was putting distance between Jake and I but I was bringing us closer to a future. When my feet finally touched the dirt path on the other side of the bridge I crumbled to my knees in relief. I had made it. I knelt only moments in the dirt before I stood and took off down the canyon for help.